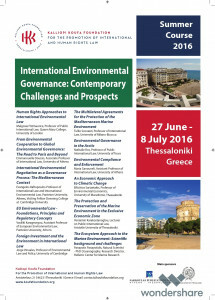 The Kalliopi Koufa Foundation for the Promotion of International and Human Rights Law is delighted to announce that the Second Thessaloniki Summer Course to be hosted by the Foundation in the historical city of Thessaloniki from 27 June to 8 July 2016 will deal with the ever-increasing importance of International Environmental Law and is titled “International Environmental Governance: Contemporary Challenges and Prospects”. 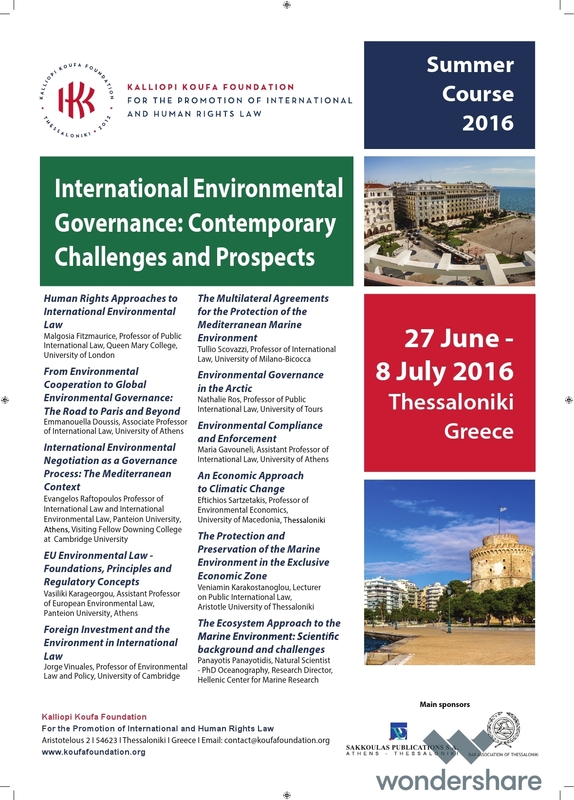 The 2016 Thessaloniki Summer Course will review the development of international environmental law over the past forty-four years and focus on its role in addressing environmental problems and contemporary challenges of its implementation and enforcement. 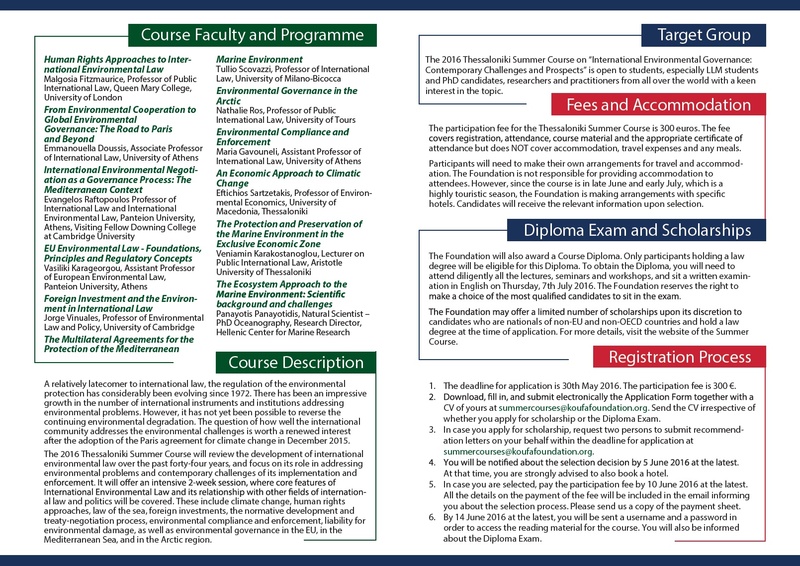 An intensive 2-week Session will be offered, where core features of International Environmental Law and its relationship with other fields of international law and politics will be covered. In addition, participants will attend special lectures, seminars as well as roundtables offered by academics, experts, policy advisers and practitioners. 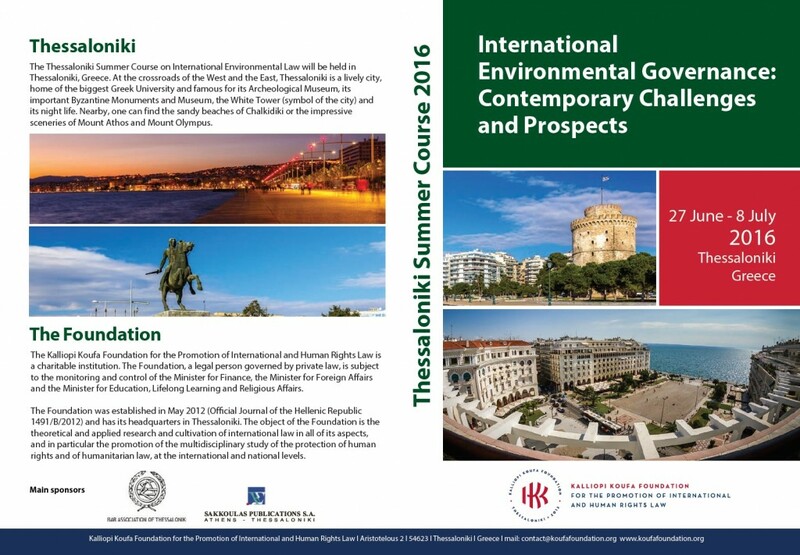 The 2016 Thessaloniki Summer Course is open to graduate and postgraduate students, especially LLM students and PhD candidates, researchers and practitioners from all over the world, with a keen interest in international environmental law. Malgosia Fitzmaurice (Queen Mary University of London, United Kingdom), Jorge Vinuales (University of Cambridge, United Kingdom), Tullio Scovazzi (University of Milano-Bicocca, Italy), Nathalie Ros (University of Tours, France), Evangelos Raftopoulos (Panteion University, Greece), Emmanuella Doussis (University of Athens, Greece).